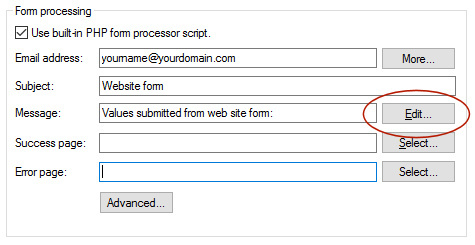 By default the submitted data of a form will be sent in plain text format. You have little control this format because the email application determines how it will be displayed to the user. However in WWB10 we have added the ability to format the message. Make sure the built-in form processor is enabled. 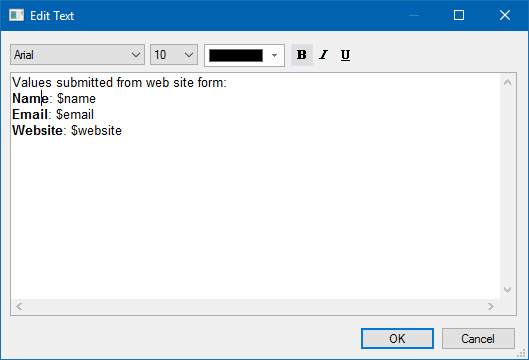 Click Message->Edit in the Form's properties. 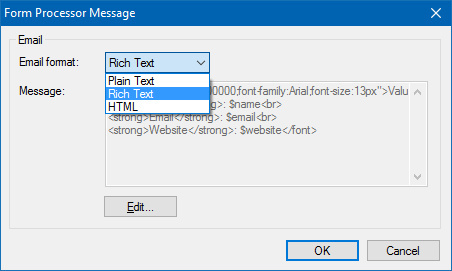 Select 'Rich Text' as the email format. Note: if you select 'Rich text' (or HTML) then the submitted data will not be included by default otherwise there was no way to format it. Where name, email and website are the names of the form fields plus dollar sign. So if the field name is 'name' then the variable name will be '$name'. When you select 'rich text' or 'HTML', the mail engine (in Advanced->Mail Engine) will automatically be set to 'Use PHP mailer', because PHP's standard mail() function does not support formatted messages.